Today's culture and pace of life can be exciting but overwhelming. Fast food, synthetic music and aromas, and the visual assault of demands for our attention can combine to make us stressed and weary. Our senses become dulled, and we forget how to use them as sentinels of the presence of God. 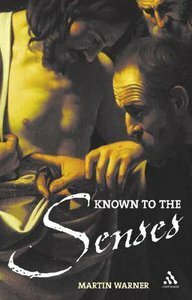 Known to the Senses is about recovery and release: the recovery of a tradition of spirituality and discipleship that nurtures our senses in the discernment and worship of God. Drawing on films, literature, art and personal reminiscences, Warner seeks to explore the media that convey something of the mysterious and astonishing experience of God, in which we are released from obsession with ourselves. This book considers the interaction of Christian experience and tradition with contemporary culture. It offers material for use in Lent by individuals and groups who are seeking to explore and deepen faith in Jesus Christ and relate it to their life and society. North Atlantic culture is spiritually depressed, with the consequence that our senses have become dulled, says Warner. They no longer function as sentinels to the presence of God.Drawing heavily on Denys Turner's influential book, The Darkness of God, Warner explores how recovery of the deliberate use or non-use of our five senses might enable us to grasp something of the astonishment about God that inspired people like Augustine and the author of The Cloud of Unknowing to write in terms of what we now describe as mystical.Warner links the senses with the liturgical celebration of the Lord's passion in Holy Week. Participation in the passion through reference to our senses can be a means of preparing for Holy Week, reflection on the nature of worship, assessing the evangelistic communication of the liturgy. Warner also examines the interaction of contemporary Christian experience with an older, Christian culture. Each chapter has a resource section with prompts for further discussion on the book's themes.Martin Warner is now Canon Pastor of St. Paul's Cathedral in London. He was formerly Administrator of the Shrine at Wahsingham. About "Known to the Senses"
Martin Warner is now Canon Pastor of St. Paul's Cathedral in London. He was formerly Administrator of the Shrine at Wahsingham.